In this document, we describe the architecture of a distributed multimedia software prototype (“Heidi-II”) currently under development at our laboratories. 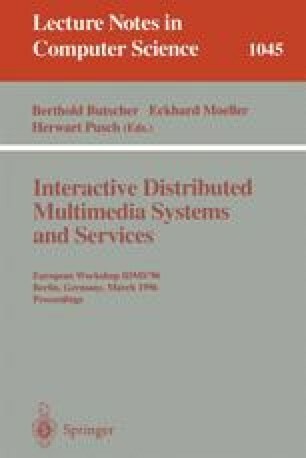 This prototype aims to demonstrate a software framework for development of efficient, quality-of-service (QoS) based multimedia applications over ATM networks, using a synergistic combination of several novel approaches. In particular, the software architecture incorporates the following key components: Jodler, a new distributed scripting language for easy-to-use and efficient object oriented implementation of multimedia applications across the network; CockpitView, a new graphical user interface for intuitive access of multimedia services over a network; ATM Service Manager, an advanced ATM API with automatic service provisioning, transport protocol options, ABR/ VBR/CBR services, dynamic bandwidth renegotiation and quality-of-service (QoS) support; VBR+, a dynamically renegotiated variable bit-rate transport mode in ATM networks for efficient support of media streams with network-level QoS control; and Multimedia Transport Protocol (MTP), a stream-oriented, lightweight media transport protocol customized for delivery of real time video/audio, etc. over ATM networks.